Ingrid Fischer-Bellman was born in Bucharest, Romania, and received her advanced musical training at Tel-Aviv University Music Academy and Indiana University School of Music. Her major teachers have included Janos Starker, Paul Tortelier, Uzi Wiesel and Samuel Shore. 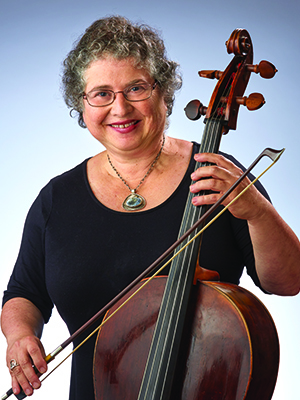 Before joining the cello section of the Indianapolis Symphony Orchestra in 1978, she played with the Jeunesse Musicale International Orchestra, the Holon Chamber Orchestra and the Tel-Aviv Academy Chamber Orchestra. Ms. Fischer-Bellman also is quite active in community outreach as an Artists In Schools instructor in the ISO's School Partnership Program. She has appeared as soloist with the Jerusalem Radio Orchestra, the Philharmonic Orchestra of Indianapolis and the Carmel Symphony. Married to ISO principal clarinet David Bellman, they are the parents of one daughter and co-founders of the Ronen Chamber Ensemble. She enjoys painting, reading and nature walks.